ITB Asia wrapped up on a high on Friday (October 19) as the annual event achieved record-breaking numbers. Held at the Sands Expo and Convention Centre in Marina Bay Sands, Singapore from October 17 – 19, the three-day conference and exhibition recorded an impressive 25,000 business appointments this year. 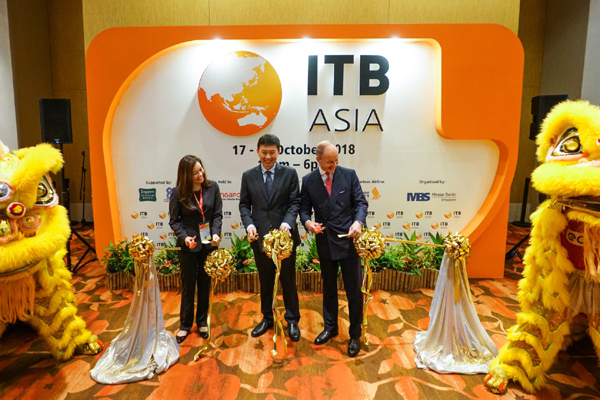 Having hosted more than 1,000 exhibitors and over 1,000 buyers this year, ITB Asia 2018 has also recorded an increase of 8.9 per cent of total visitors representing more than 127 countries from last year’s anniversary event. Under the overarching theme of “Travel Reimagined”, this year’s conference programme delivered major trends provoking disruption across the travel industry and how companies are innovating to stay ahead. With over 260 speakers, key industry experts delivered fascinating insights at the keynote sessions, as well as focused topics for the Mice and corporate segment, the Travel and Tech space and Muslim Travel conference sessions, which were very well-received. “Having surpassed last year’s impressive milestone, we have yet again achieved record-breaking numbers as we continue to see the show flourish. As we look forward to next year’s ITB Asia, we continue to build and strengthen our efforts in maintaining ITB Asia as the premier event of the year and the go-to hub for remarkable travel content and inspiring experiences. My greatest thanks and appreciation go out to all our supporters across the industry and the teams involved for their endless hard work in making this event happen”, said Katrina Leung, managing director of Messe Berlin (Singapore), the organiser of ITB Asia. Following yet another successful edition, the show is already receiving high exhibitor re-bookings for ITB Asia 2019. As early as now, the surge in interest for next year’s show has been seen from hotel groups such as Amara Hotels & Resorts, Best Western International, Frasers Hospitality, Resorts World Sentosa, WorldHotels AG and many more. ITB Asia sees continued strong support from destinations in the ASEAN region as well as Abu Dhabi, Turkey and Jordan in the Middle East and exhibitors such as Austria and Lufthansa City Center amongst others. Eastern European exhibitors such as Hungary and Poland have also confirmed their stand bookings for the 2019 show.